This is one of those strange combinations that you might be a little unsure of…until you taste it. The salty, earthy clams play perfectly against the spicy, rich sausage and is also one of those recipes that you can double or triple very easily for large groups. 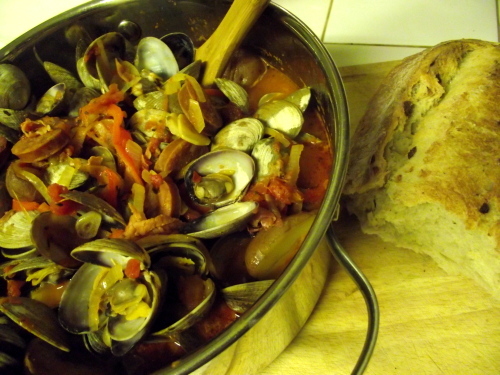 To me, a big pot of steaming clams and chorizo is comfort food 101. Share with some friends, a giant loaf of crusty bread, and maybe a good bottle of wine or two. Trust me, you won’t be disappointed. Rinse your clams very well in cool water to remove any grit or sand and set aside in fridge. In a large heavy pot saute the chorizo “coins” on medium until the fat runs out and coats the pan. Add onions and peppers and cook for 8 min or until onions and peppers are softened. Add garlic, tomatoes and spices and cook for another 5-6 minutes. Add wine, turn heat up slightly, add clams and seal pot for 8-9 minutes until all clams are open. Garnish with chopped fresh parsley and serve straight from the pot.